We are so excited to share a super, special party with our readers today. 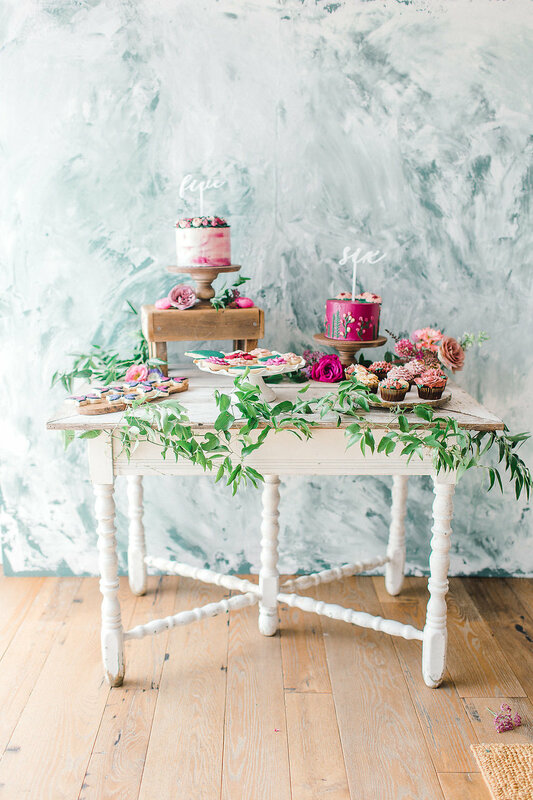 Together with Black Twine, Jacqui of Deets and Things, has put together the most magical fairy celebration for her little girls. Read on for more…. Josephine and Eleanor’s birthdays are a week a part so every year we make a huge celebration out of their joint birthday parties. It’s something our friends and family look forward to enjoying alike. 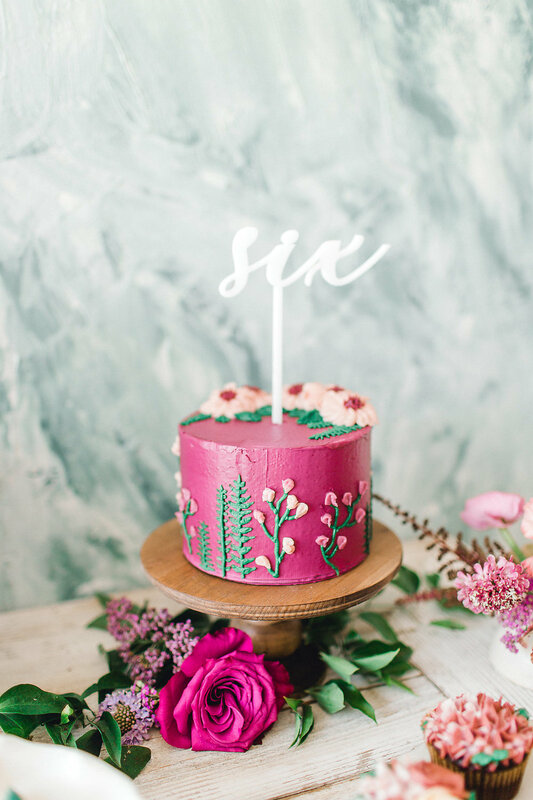 With fall fast approaching, I opted to go for a deep and inviting color palate for their fairy themed party. I wanted the kids to feel like they were swept away into an enchanted garden so I built a tunnel over the kids table and Not Just in Novels transformed it with beautiful jewel toned blooms and southern smilax. It was absolutely magical to sit engulfed in dripping blooms and butterflies. 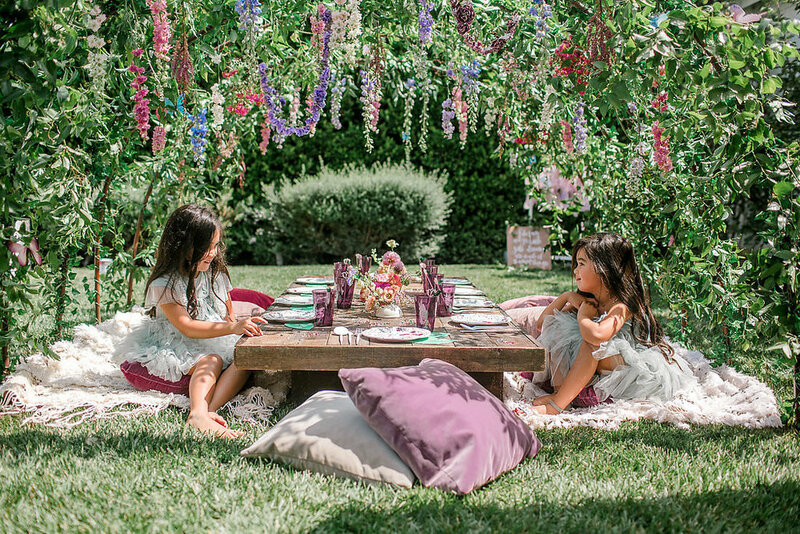 The kids table was set with the prettiest whimsical plates and the cutest leaf napkins from Meri Meri. 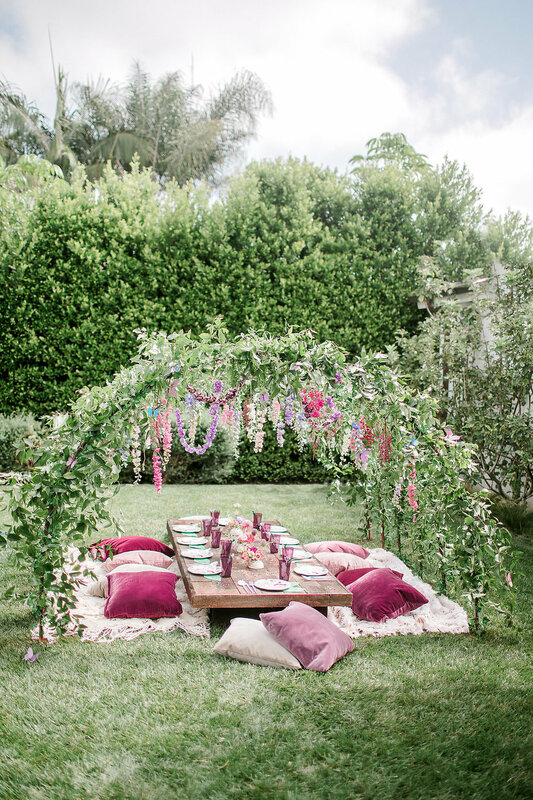 You can find the blueprint to recreate this setting and so much more on Black Twine. There was no shortage of sweets for the guests! The Paleta Bar provided a perfectly themed treat for guests who could add their choice of glittery or starry fairy pixie dust to their delicious popsicle. 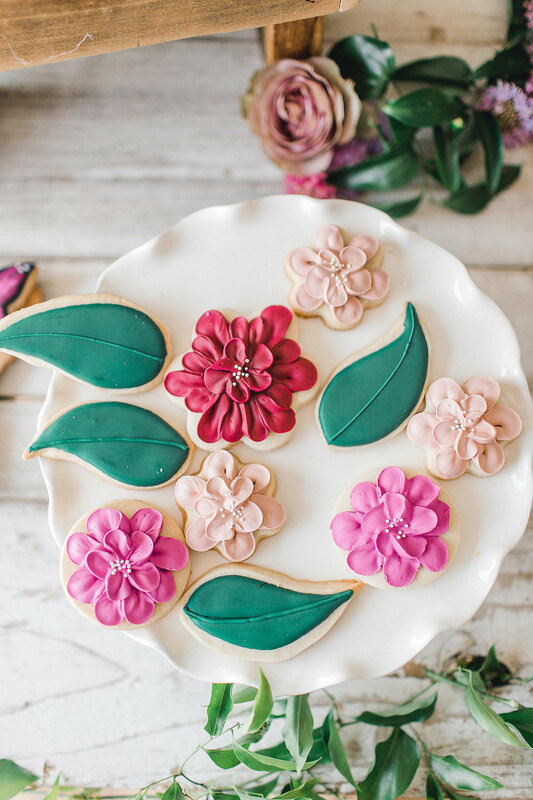 Other delights included gorgeous rich toned sugar cookies from Jessi Loves Sugar Cookies and the daintiest buttercream floral cakes from Sweet Song Bird Bakery. We personalized the fairy wings so that each tiny guest was a different garden fairy. These floral fairies enjoyed themselves as they “made a little magic” at the wand decorating table and got their nails “fairy” sparkly at the Mobile Salon bar provided by Nails by Colvon. There was a just a bit of fun for all! 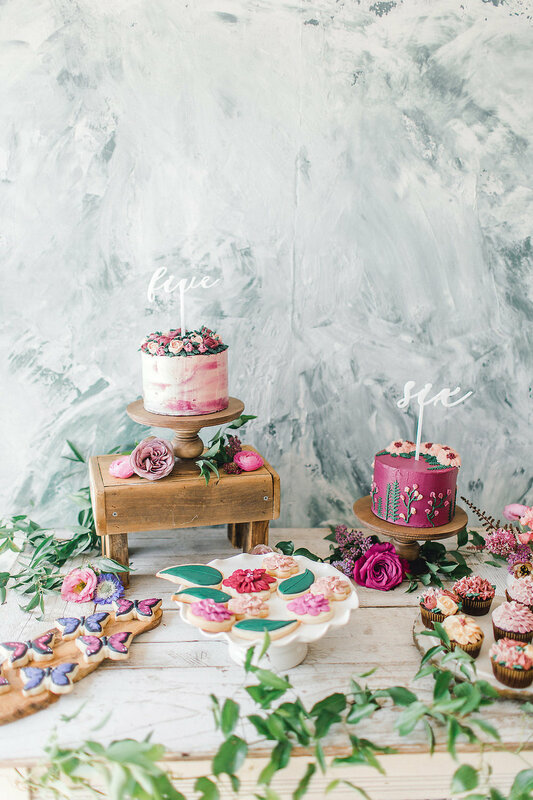 For the photo backdrop I scattered lush silk blooms in colors that matched the palette of the plush pillows from Sweet Salvaged Rentals and our table setting. The laser cut words from Creative Amme was the perfect finishing touch for all our photo ops.